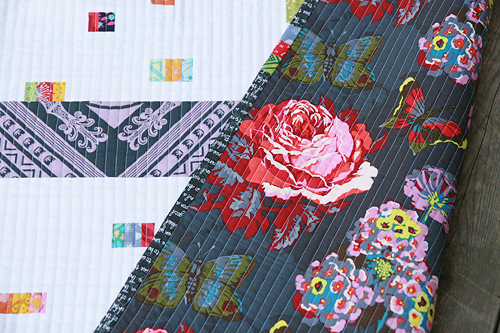 This month the Naperville Modern Quilt Guild had a log cabin challenge. 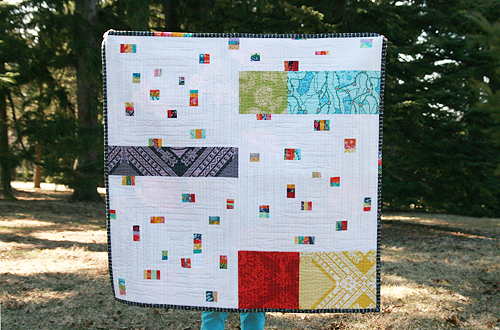 We were all asked to make a 36" x 36" quilt with log cabin(s) in a modern way. Last night was the meeting and everyone came up with such great designs! Really, no two were alike. It was a lot of fun seeing everyone's quilts and the thought that went into all of them. I decided to make all white log cabins with tiny strips of bright fabrics randomly incorporated into the logs. The logs are various widths, from 1-1/2" to 1/2" finished. 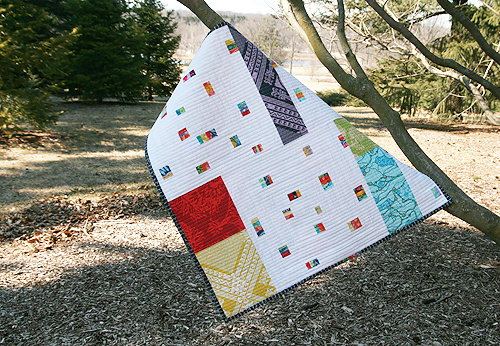 This quilt was pretty improvisational. Although I had a plan for the blocks in my head, I wasn't really sure about how to put them together. At first I was thinking about 1 giant block. Then it changed to multiple blocks. Then I decided I needed some separation to define the blocks. Ideas floated around from using neutral tan to narrow strips of color, stacked. But in the end I decided on larger color blocks. I quilted this in straight lines, about 1/2" apart. 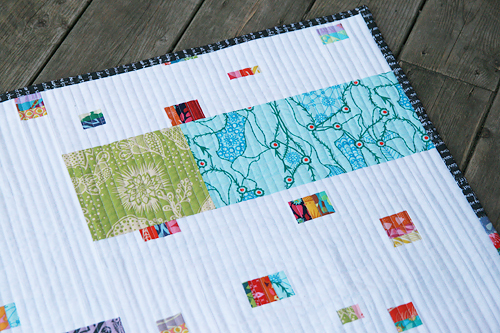 The backing is one of my favorite prints from designer Anna Maria Horner. The binding was also something that changed at the last minute. 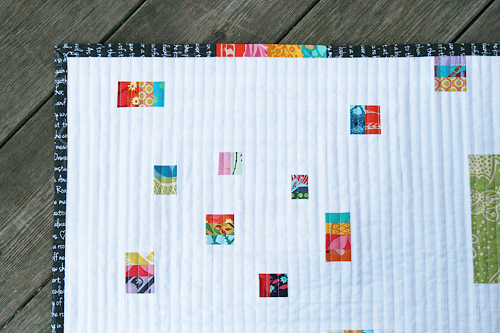 I was planning on doing bright scrappy binding, but after it was cut it just seemed like too much. So I went looking through my stash and my eyes were drawn to one of my favorites from Violet Craft's Madrona Road - the black text print. I worked in a couple spots of bright strips just to echo the design of the blocks. And in an Arkansas Traveler update...I finished the quilt top! It looks great and the backing just arrived. 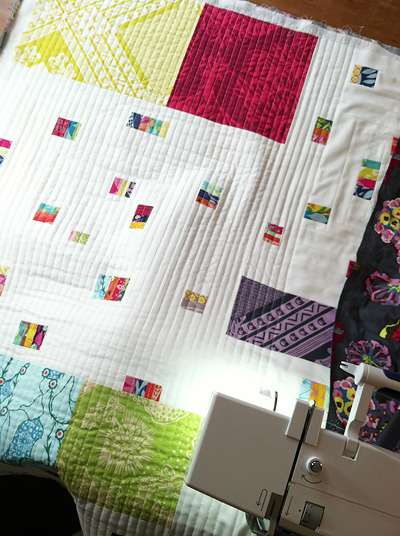 I am still deciding on the quilting, but that will be the next large project to tackle on my list.